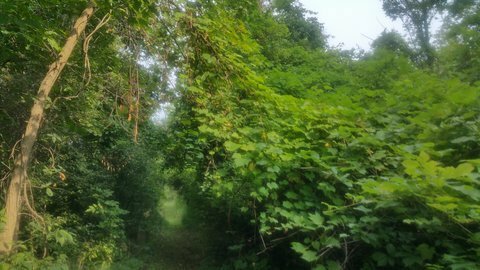 It has been hot and humid these past few days, with almost a tropical feel to the air, and I have been sweating profusely while working to clear more of the bush between the house and the fields in the back. Adding to the jungle-like atmosphere, grape vines hang from trees in that area and smother many bushes and small trees. When we first discovered wild grape vines growing in this County, I was rather impressed and pleased. But now the only good thing that I can say about them is that they are not thorny Himalayan blackberries which grow so abundantly in the Fraser Valley. 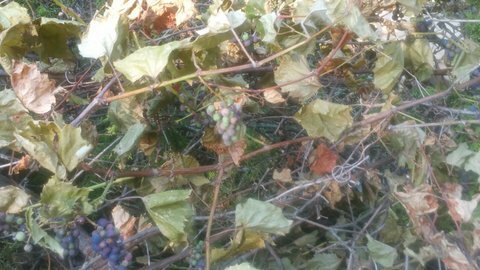 Wild grapes grow as fast, or even faster, than the Himalayan blackberry. 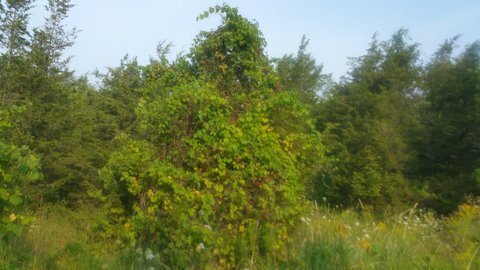 When we were visiting here in early June, I cut a number of wild grape vines out of one tree but this morning, about 10 weeks later, I discovered several dozen growing in their place, all of them between 10 and 20 feet in length! Out in the pastures, grape vines can grow fast enough to grow across the newly mowed trails in just a week or two. They can grow as thick as a man’s arm. 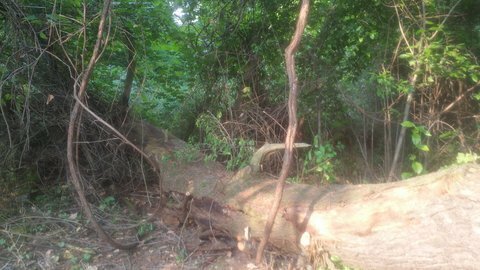 I didn’t think to take a picture of the large vine hanging from a tree before I cut it down but you can get an idea of its size from the piece (below) compared to the 18 inch thick tree trunk. A piece of a grape vine that had been hanging from this tree. The tree trunk is 18 inches thick. Even more 1 and 2 inch vines hang from trees. At that thickness, they are strong enough to resist being pulled out of trees. I spent several hours this morning, trying to stack the branches of the tree that I cut. 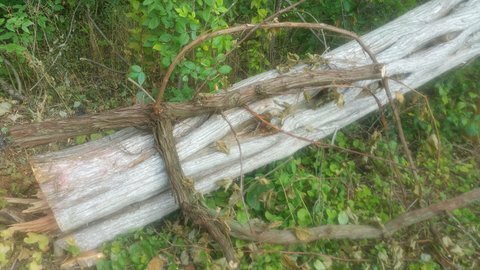 Every branch was so entangled in strong grape vines that I could not drag them without first spending time cutting all the vines. Grape vines of this size (1 – 2 inches thick) commonly hang from trees. Many smaller trees are completely covered by the vines. The tree in the center is a red cedar (Virginia juniper) but it is almost unrecognizable under the wild grape vines. And some whole areas of the bush are being smothered by them. Almost all of the foliage to the right of the path is wild grape. It completely covers the bushes and small trees. Unlike Himalayan blackberries which compensate for their invasive, thorny character with luscious fruit, the fruit of the wild grape are small, bitter and have large seeds. Small clusters of grapes were produced high up. The foliage is brown because the vine was cut down a number of days ago. Perhaps we will find eventually some redeeming qualities and good uses for the wild grape. In the meantime, however, I find myself daydreaming of a big herd of goats! I have read that goats love to eat the wild grape vines and often work hard to pull the vines out of trees in order to get at the leaves and soft growth. We are not ready for livestock yet, but as I struggle with the grape vines, my motivation to get goats as soon as possible is increasing. It would be a win-win situation. They get the natural food that they love and we get their help in beating back the jungle! I’ve heard of goats even clearing blackberries (I didn’t know that the blackberries were Himalayan, so I learned something new today). I have great memories of visiting my great aunt and uncle in Saskatchewan when I was six, and having Saskatoon berries in goat’s cream. So the goats would definitely be a win-win situation, turning grapes into milk and cream. Yes, I have seen goats clear sections of Himalayan blackberries. They are called “Himalayan” because they because they originated in Asia. They have become highly invasive in many temperate areas, including coastal BC, but fortunately – from the standpoint of trying to reclaim abandoned farmland – not here in Ontario. That is one advantage of a colder climate. I am hoping that we will do well with goats but, once we are ready, will have to start small with them and work from there.